Sulaiman W, Seung OP, Ismail R. Patient’s Knowledge and Perception Towards the use of Non-steroidal Anti-Inflammatory Drugs in Rheumatology Clinic Northern Malaysia. Oman Med J 2012 Nov; 27(6):505-508. The used of NSAIDs has been well established worldwide with an estimated daily intake of 30 million people.1 Patients have easy access to these drugs either over-the-counter (OTC) formulations as well as in prescription form. NSAIDs are commonly used in both osteoarthritis (OA) and rheumatoid arthritis (RA) to reduce joint pain and to improve joint function.2,3 It is important as part of the disease management. Previous studies had demonstrated that, despite being widely used, the adverse effects of NSAIDs, patients’ knowledge and awareness of potential side-effects of the medicines has been poor.9 This study focuses on the knowledge and perception of patients of NSAIDs at the Rheumatology clinic setting, Hospital Raja Permaisuri Bainun, Malaysia. This is a descriptive cross sectional study involving patients who attended the Rheumatology clinic, at Hospital Raja Permaisuri Bainun Ipoh, Malaysia. The patients were aged more than 18 years, and were prescribed non-steroidal anti inflammatory drugs (NSAIDs) for more than 3 months, irrespective of their rheumatic disorder. Other demographic data such as gender, ethnicity, education levels, duration of disease and duration of NSAIDs used were recorded. The study was conducted within 4 weeks duration; with a total patient follow-up for a week for 30 patients. The study was conducted by interviewing the patients using a prepared questionnaire. The purpose of the study was explained verbally in Malay or English languages to each patient and the questionnaire was completed after obtaining written consent. From calculation (Epi-info), assuming frequency of knowledge of Malaysian population is 50 %, with confidence Interval of 95% and lower limit of 40%, sample size was 96 patients. One-hundred-and-twenty samples were collected within 4 weeks of study due to total sampling method and to validate the sample for subgroup analysis. Descriptive statistics, including percentages, means, standard deviation, frequencies and cross-tabulations were determined. Table 1: Baseline demographics and clinical characteristics. *Primary = primary school, age from 7 year to 12 year; Secondary = secondary school, age from 13 year to 19 year; Tertiary = College or university levels. Irrespective of the rheumatic disorders, 66 (55.0%) patients were using Meloxicam (Mobic) followed by 40 (33.3%) patients using Celecoxib (Celebrex) and 8 (6.7%) were on diclofenac sodium (voltaren), while 6 (5.0%) patients were taking Etoricoxib (Arcoxia). Worsening of pain was influenced by the change in treatment for majority of the patients. While most of the patients (77.5%) tried other therapy such as exercise, 10% of them decided to remain with the status quo and others (5.8%) either increased the dosage of the drug or the doctor changed the NSAID. Meanwhile, 27 (22.5%) patients used traditional medicine in combination with NSAIDs. However, out of those, 6 (22.2%) continued with the NSAID while 21 (77.8%) discontined therapy. The main reason for discontinuation being that the drug was ineffective. A large proportion of the patients were prescribed NSAIDs due to of pain and symptoms of swollen joints. Some of the patients had developed irreversible damage leading to deformities and disability due to active disease, while 87% of the studied patients had been taking NSAIDs for more than 1 year. Moreover, over half (54.2%) of the study participants actually had knowledge or awareness of the side effects attributed to NSAIDs. However, the remaining 45.8% of patients were unaware of the adverse implications of the drugs. The results indicate that females (61%) exhibited greater knowledge and concerns about the side effects compared to their male counterparts (39.5%). As far as ethnicity is concerned, 71.1% of Malays were more knowledgeable about the side effects of NSAIDs, followed by 46.2% Chinese and 33.3% Indian patients. However, this finding was not significant since the distributions of the sample was not equal and the sample frequencies were small. Language barriers, low socio-economic and educational levels were among the main factors affecting these results. Meloxicam was most commonly used for osteoarthritis (50%) and rheumatoid arthritis (59%), followed by celecoxib and diclofenac sodium. Diclofenac sodium was the drug of choice for gouty arthritis. In addition, only 65 patients were aware of the possible side effects of NSAIDs; the information was mainly obtained from Hospital (75.4%), either from the clinician or nurses, 15.4% (10) and 9.2% (6) obtained the information by surfing the internet and from newspapers, respectively. However, none of the patients reported that they obtained information from television, colleagues or magazines. Patients were advised to seek immediate treatment at hospital (31; 47.7%) or stop taking the medication (30; 6.2%) when they experienced adverse effects of the NSAIDs. Only a small number of patients were advised to continue with the therapy but with precaution (4; 6.2%). Table 2: Distribution of types of NSAIDs used in difference diseases. OS: Osteoarthritis; RA: Rheumatiod arthritis; Mlxcam: Meloxicam; Clcoxib: Celecoxib; Etrcoxib: Etoricoxib. Table 3: Distribution of side effects of NSAIDs. Table 4: Amount of NSAIDs prescribed consumed by patient. *Estimated amount of NSAIDs prescribed taken by patients following each consultation visit. NSAIDs were prescribed for almost all arthritic patients either in regular or pro re nata basis irrespective of the rheumatological diagnosis. In our survey, rheumatoid arthritis patients receiving NSAIDs outnumbered other rheumatic disorders compared to the study conducted by Wynne and Long where NSAIDs were mostly prescribed for osteoarthritis followed by rheumatoid arthritis and other disorders.13 The difference appears to be attributed to the number of RA patients most commonly seen at our rheumatology clinic, whereas more of OA patients are treated by orthopedic surgeons. In this study, the number of patients who developed gastrointestinal symptoms due to chronic usage of NSAIDs were relatively high compared to the study conducted by Silvani et al.17 However, only a small number of the studied patients (10.8%) had taken the prescribed medication with gastro protective agents, either H2 antagonists or proton pump inhibitors (PPI). The current study revealed that the majority of patients were taking less than the number of NSAIDs prescribed after consultation with a clinician. Overall, one fourth of the study participants expressed worry and concerns about the side effects of the drugs they were prescribed. There was also a patient who shared their prescribed medication with other family members. In summary, as with other studies, as part of the rational pharmacotherapy of rheumatology; clinicians and pharmacists play a major role in educating and providing patients with the necessary details of the prescribed medications. Programs such as medication therapy adherence clinic (MTAC), which recently started at our rheumatology clinic and run by a pharmacist, have attained a positive response from patients. Factors such as knowledge, attitudes and motivation are particularly important in terms of patient compliance and the effectiveness of therapy. These factors may be influenced by the patient’s education level, gender, the type of the disease and medication, as well as doctor-patient relationship, and culture, etc. Further larger scale studies addressing this issue should be undertaken in the near future. 1. 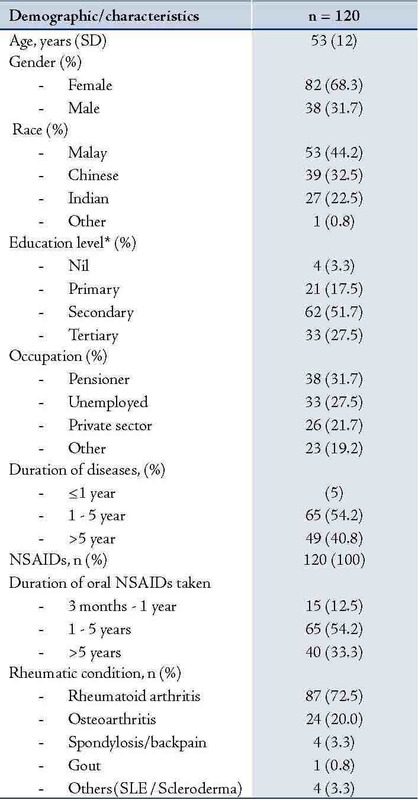 Singh G, Triadafilopoulos G. Epidemiology of NSAID induced gastrointestinal complications. J Rheumatol Suppl. 1999;56:18-24. 2. American College of Rheumatology Subcommittee on Osteoarthritis Guidelines. Recommendations for the medical management of osteoarthritis of the hip and knee. Arthritis Rheum. 2000;43:1905-1915. 3. American College of Rheumatology Subcommittee on Rheumatoid Arthritis Guidelines. Guidelines for the management of rheumatoid arthritis. Arthritis Rheum. 2002;46:328-346. 4. De Vries TPGM, Henning RH, Hogerzeil HV, Fresle DA. Guide to Good Prescribing. World Health Organization, Action Programme on Essential Drugs, 1994. WHO/DAP/94:11. 5. De Vries TPGM. Presenting clinical pharmacology and therapeutics: a problem based approach for choosing and prescribing drugs. Br J Clin Pharmacol 1993; 35: 581-6. 6. WHO. (15-27 October 1998) Promoting rational drug use. Trainer’s guide. Accra, Ghana 1998. 7. Popovich NG. Ambulatory patient care. In: Gennaro AR, ed. Remington’s pharmaceutical sciences, 17th ed. Pennsylvania: Mack Publishing Company, 1985: 1681-701. 8. Edwards L, Roden DM. Principles of prescription order writing and patient compliance. In: Gilman AG, edr. Goodman & Gilman’s The pharmacological basis of therapeutics. Tenth edition. USA: McGraw-Hill, 2001: 1903-15. 9. Isacson D, Bingefors K. Attitudes towards drugs - a survey in the general population. Pharm World Sci 2002; 24: 104-10. 10. Ridout S, Water W, George CF. Knowledge of and attitudes to medicines in the Southampton community. Br J Clin Pharmacol 1986; 21: 701-702. 11. George CF, Waters WE, Nicholas JA. Prescription information leaflet: a pilot study in general practice. Br Med J 1983; 287: 1193-1196. 12. Hürriyet YILMAZ, Selim GÜREL, Oktay ÖZDEMİR; Turkish patients with osteoarthritis: Their awareness of the side effects of NSAIDs; The Turkish Journal of Gastroenterology 2005;16:89-92. 13. Wynne HA, Long A. Patient awareness of the side effects of non-steroidal anti inflammatory drugs (NSAIDs). Br J Clin Pharmacol 1996;42:253-256. 14. Jobanputra P, Arthur V, Pugh M, Spannuth F, Griffiths P, Thomas E, Sheeran T. Quality of care for NSAID users: Development of an assessment tool; Rheumatology 2005; 44: 633-637. 15. Ornbjerg LM, Andesen HB, Kryger P, Cleal B 2008; What do patient in Rheumatologic care know about the risk of NSAIDs? J Clin Rheumatol 2008;14:69-73. 16. Paul AD, Chanhan CK. Study of usage pattern of NSAIDs among difference practice categories in India clinical setting; Eur J Clin Pharmacol 2005;60:889-892. 17. Silvani MC, Motola D, Elisabetta Poluzzi, Ambrogio Bottoni; Gastrointestinal problems and concomitant medication in NSAID users: additional findings from a questionnaire based survey in Italy; Eur J Clin Pharmacol 2006; 62:235-241.